In effect General Mills has turned its Box Tops for Education campaign into an open source cause marketing campaign. I realized this as I walked into Sam’s Club the other day and was handed the handbill above. On the front it details a small promotion for earning bonus Box Tops. 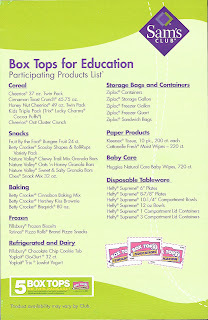 On the backside it lists 33 items available in Sam’s Club that participate in Boxtops for Education. But here’s the kicker, they’re not all General Mills products. As I noted in my April 3, 2007 posting, General Mills opened up Box Tops to other non-competing brands in 2006. What wasn’t apparent to me then was the degree to which General Mills has pulled its own branding from the Box Tops campaign. Notice that General Mills name and logo are conspicuously absent from the Box Tops logo. If you go to the Box Tops for Education website you’ll find General Mills in the fact sheet. But otherwise its presence is largely confined to a small copyright notice at the bottom of each page. In effect, General Mills has opened up its “source code” to non-competing brands, including Scott paper towels, Huggies baby wipes, Hefty disposable plates, plus retailers including J.C. Penney, Land’s End, and, to a degree, Sam’s Club. Why would General Mills do this? In software coding you do it for several reasons none the least of which is that many hands make light work. Certainly the change has boosted the campaign. According to their website, by 2004 Box Tops had generated $100 million for America’s schools. General Mills got there by adding the lion’s share of their own brands to Box Tops. In 2006 they opened up the program to non-General Mills brands. Now in the eighth month of 2007, they’ve already crossed the $200 million mark. Relatedly, after all their brands were in the program, General Mills had only two ways to grow the campaign: organically or by bringing in other outside brands. General Mills probably gets some sort of fee from the other participants for administering the campaign. Plus, there’s broader competitive reasons. Retailers including Target, Wal-Mart, Kroger and others all sell house brands that compete with General Mills, Kimberly-Clark, Ziploc and others. Oftentimes those house brands represent a retailer’s richest profit margins. Consumers are buying more and more of these of these house brands. Box Tops for Education represents a way for manufacturers to stem that tide. Call me a geek, but I’m anxious to watch and see how open source cause-related marketing develops. That is a great observation. Yes please do follow this with all scrutiny that a true geek would. I am looking forward to reading you future analysis.